Hello All! This week for our design team project for The Cutting Cafe, we used the new Lip Balm Chapstick Holder Set. The file comes with a few variations – a box, and a single holder that you make a cover out of clear acetate or paper which you can give as is or add to a card or tag. I think this one is so cute. I made the box which holds three lip balms. You can decorate for men, women, boys, and girls and they make great favors for showers, parties, friendship exchanges, teachers gifts, co-workers, grab bags, etc. I added a shaker element to the window of my box but you can use acetate or velum instead. I just added some bling stickers and a sentiment from the file on both the front and back of the box. This week for The Cutting Cafe, the design team got to use any Christmas file we wanted to. I have been in craft fair mode so I chose this cute Christmas Tree Goodie Bag Holder. It can be used to hold candy, money, or crafty items like I have used. It makes a great craft fair item, teacher or coworker gift, or a stocking stuffer. 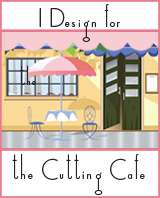 Make sure you visit The Cutting Cafe Blog on the 7th and 21st of each month to see the design team projects. Leave a comment to be eligible for a drawing to win three files of your choice. For more detail on my project, here is a video for you. Thanks for stopping by!